Practitioners should employ Evidence-Based Medicine or Best Evidence whenever possible. No one would argue with that. If a patient presenting with chest pain has a very low probability of a pulmonary embolism based on good evidence, it would be inappropriate to order a CT scan and expose a patient to the dangers of unnecessary radiation. Alternatively, if an algorithm suggests that pulmonary embolism is likely or probable, it would be inappropriate to “fail to order” a CT scan of the chest. It is important to note that although the term “evidence-based medicine” is used often, there isn’t much of it around. The term connotes that a subject area (e.g., the need for CT to rule out pulmonary embolism in a chest pain patient) has been so well studied and that a test or algorithm has been so well evaluated that a positive or negative result clearly establishes the presence or absence of a disease or clinical entity. That typically involves a major research organization evaluating dozens if not hundreds of clinical trials, finding a good number that are of high quality, and performing a meta-analysis with as big a denominator as possible. Such publications will typically be recognized by national organizations such as American Heart or American Stroke that will publish related Guidelines around the subject area and indicate the strength of the corresponding clinical trials by categorizing recommendations as Level A, B or C.
The reality is that not many of these exist. More will appear over time, but practitioners would be surprised at the relative rarity of clinical decisions that have strong related evidence-based algorithms available. That said, if such algorithms exist, they are invaluable. If an adult with chest pain has a very low probability of PE, the patient avoids a CT and the physician can focus on another diagnosis. If a child with head trauma scores all negatives on the PECARN calculator, there is no need for a head CT and the physician and parents can rest assured that the evidence clearly indicates the child is at low risk. Additionally, in the unfortunate event of an adverse outcome, following such guidelines provides the practitioner and patient or parents comfort in knowing that withholding the CT is well supported by national guidelines. If the evidence is available, there should be complete clinical practice alignment around these evidence-based guidelines. But we return to the fact that we are only human. 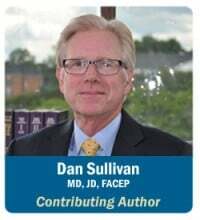 EHRs typically don’t have good content; they don’t contain Guidance, don’t provide usable clinical decision support, and certainly don’t present evidence-based algorithms seamlessly in the mental workflow. The pulmonary embolism algorithm is a perfect example. The medical evidence supports the use of a tool such as the Modified Well’s Criteria to gauge the risk of a PE, but an additional test or calculator called PERC is required to establish that “very low probability” of PE that allows the practitioner to withhold a CT scan. There are seven elements in the Modified Wells Score. These elements are not remembered or front of mind for any practitioner. If those answers are all No, then you apply PERC, which has 8 additional elements. Practitioners don’t remember these either. In a patient in whom you have considered a PE in the differential, this or a similar analysis should be done. Based upon excellent evidence and encapsulated in national guidelines, the practitioner’s medical decision-making should make it clear that this analysis was done and that a CT was or was not necessary based upon the result. The problem is that this algorithmic process is not part of the current EHR world; it falls flat on content, Guidance and decision support. Evidence-based medicine in the clinical workflow is simply not on the radar screen. But it must be! 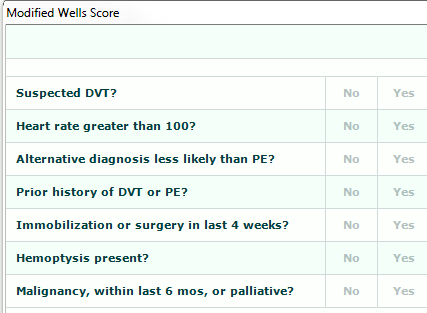 If you look carefully at Modified Wells and PERC queries, you will notice that 13 out of 15 items should be pre-answered by information already in patient demographics, history, physical exam and vital signs. That is, the practitioner’s work on the front end should automatically populate 5 of 7 items in Modified Wells and all 8 items in the PERC calculator. By the time the practitioner gets to Medical Decision-Making, it is only necessary to click Yes or No on two questions that require practitioner judgment; then the algorithm is complete, the level of supporting evidence is apparent, and the risk analysis with its supporting literature is immediately available. A single click, and that entire process is inserted into the medical record. What would typically take several minutes pulling resources from disparate sources followed by many clicks, scrolling and copy/pasting can and should be accomplished in seconds with as few clicks or touches as possible. If the evidence is not presented in an easy-to-use format inside the physician’s workflow, the practitioner is far less likely to appropriately think through the process, populate the calculators, and document the process. If the evidence is in an algorithmic format, if the level of research Guidance is clear, and if the tools or calculators are pre-populated through the design of the template (Content + Guidance), the entire process can be documented in 4 clicks and the practitioner is far more likely to use it. The bottom line is that evidence-based medicine or best evidence should be built into the EMR as part of the clinical workflow. The evidence should be coordinated in an algorithmic fashion. 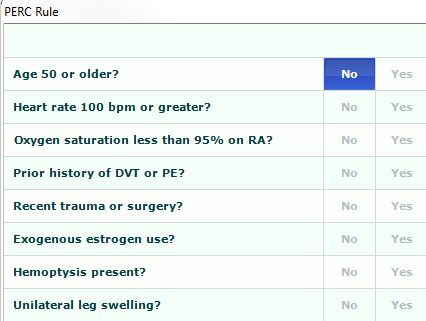 The queries should be automatically populated from the patient’s past or current medical record. Medical decision-making should be ready and waiting upon the practitioner’s arrival. And the output should make it clear to the practitioner what Level of Evidence has been reached and exactly what the evidence dictates for a particular patient. 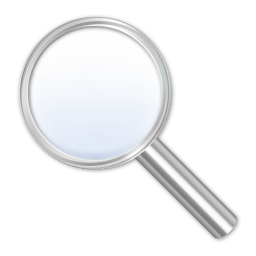 Should your EHR Documentation Templates Include Chief Complaint-Specific Content? 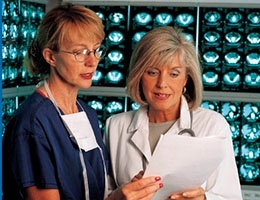 Does Guided EMR Documentation Impact Clinical Practice, Documentation Compliance and Outcomes?